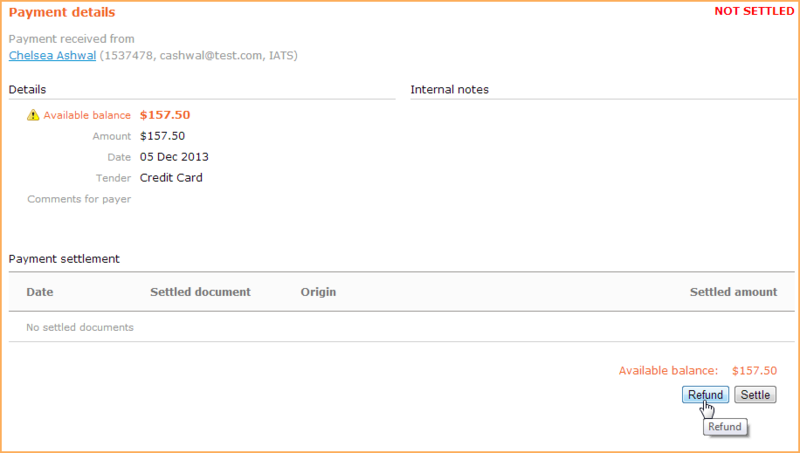 In Wild Apricot, you can process and track refunds for payments you have already received. automatic – you issue the refund in your payment processor account and it is automatically recorded in your Wild Apricot account and settled to the appropriate payment. manual – you issue the refund in your payment processor account and then have to manually record the refund in your Wild Apricot account. Currently, Wild Apricot Payments/AffiniPay does not support automatic refunds. Refunds for payments made via Wild Apricot Payments/AffiniPay must be recorded manually after issuing the refund from your AffiniPay portal. For more information, click here. A manual refund can be full, when a complete payment amount is returned, or partial, when only a partial amount is returned. Therefore, a payment record can be refunded and settled with one or more partial manual refunds. An automatic refund must be a full refund. Partial refunds made via your payment system will not be recorded in Wild Apricot. For information on applying a credit to an account, see Recording credits or payments on account. Automatic refunds are refunds that are issued outside of Wild Apricot but are automatically recorded and settled within your Wild Apricot account. Find the payment transaction you want to refund. 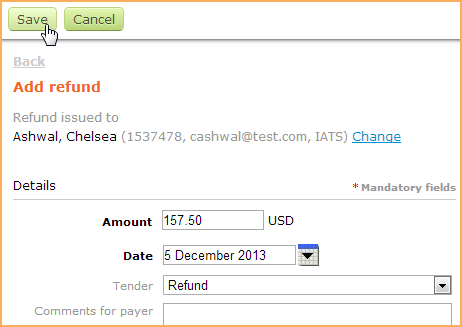 Within the payment details, click the Issue Refund or similarly named button or option. Indicate the amount of the refund. Save or otherwise complete the refund. A refund notice will be created and automatically sent to Wild Apricot after the administrator confirms the refund. Record a confirmation that the refund notice was received. Create a new refund record. 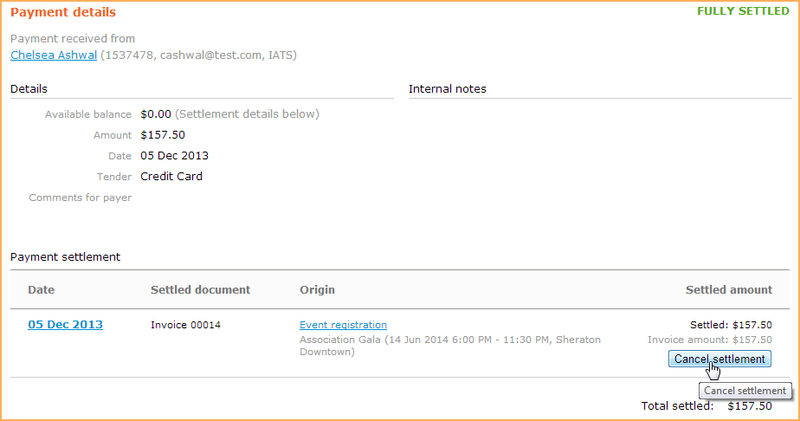 Find the corresponding payment and automatically settle the refund with the payment. If the corresponding payment is not found or if the refund notice is not received by Wild Apricot (e.g. due to some technical malfunction) then the refund has to be processed manually. If you issue an automatic refund for a settled payment, the refund will be applied to the payment and the corresponding invoice will become unpaid. Manuals refunds are refunds that you record manually in your Wild Apricot account. You can issue a manual refund for any payment recorded in Wild Apricot. Refunds must be recorded manually when refunding a manual payment, and when refunding a payment made using a payment system that doesn't support automatic refunds. Refunds for payments made via Wild Apricot Payments/AffiniPay must be recorded manually after issuing the refund from your AffiniPay portal. For more information, click here. Wild Apricot does not process any transactions, so recording manual refunds in Wild Apricot will not result in the transfer of any funds. The transferring of funds associated with a manual refund must be initiated by you from within your payment processor. You can issue a manual refund either against a payment or to a contact's account. For details on issuing both types of manual refunds, see below. Usually, a refund is recorded for a corresponding payment. You can only refund payments that have open balance (not fully settled to one or more invoices). The refund will be applied to the payment and the corresponding invoice will become unpaid. If you don't want the invoice to appear unpaid, you can reduce the invoiced amount﻿ or record a credit﻿ to the contact's account then apply the credit to the invoice. Instead of issuing a refund for a particular payment, you can issue a refund directly to a contact's account without settling the refund to any particular payment. You can, at any time in the future, settle the refund to a payment. Hover over the Finances menu and select the Payment & refunds option. 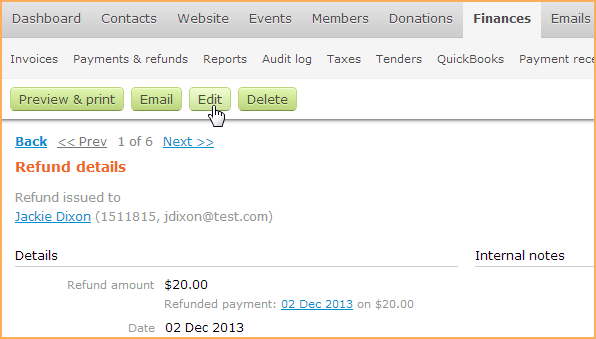 From the Payments & refunds screen, click the Add refund button. 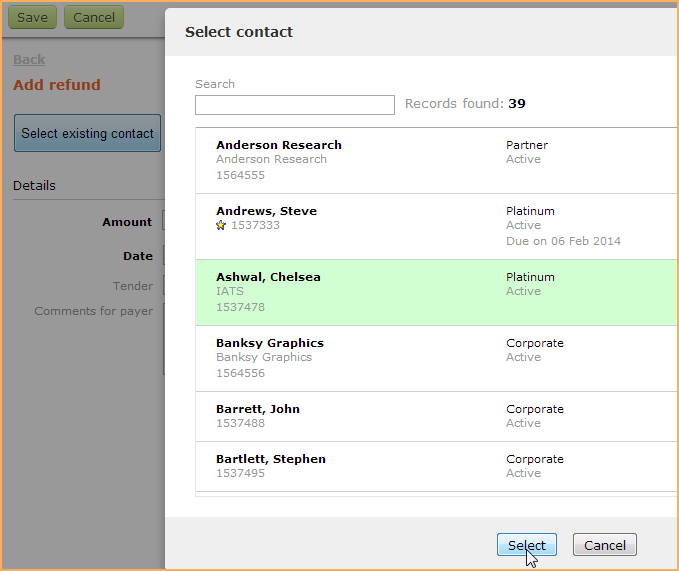 On the Add refund screen, click Select existing contact and then select the contact from the list. 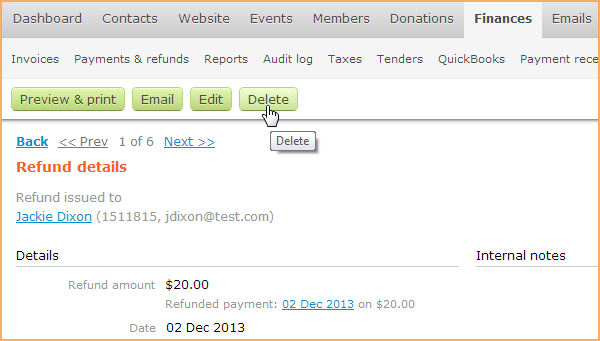 After you select the contact, fill out the refund details and click the Save button. The refund will reduce the available balance for the contact. The refund will be marked as not settled. To settle the refund, you need to find an unsettled payment for the contact and settle it with the refund. Refunds initiated from PayPal are automatically settled with the corresponding payment. 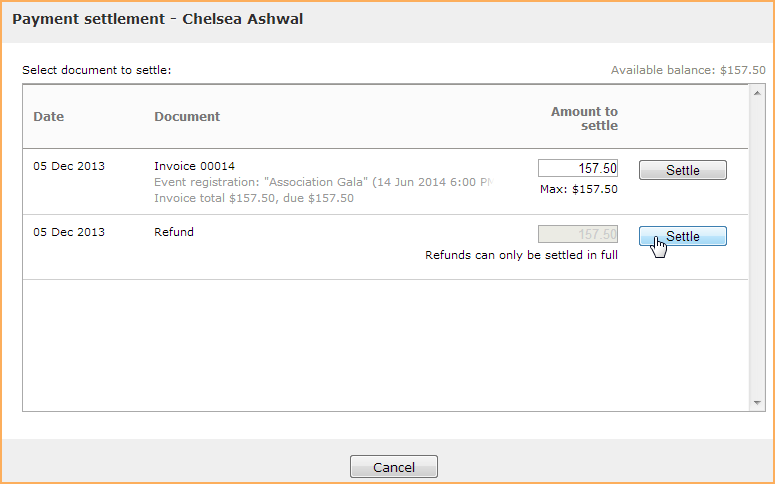 Refunds issued against a recorded payment are settled with that payment. However, if you record a refund to a contact's account, you can settle the refund manually. Find the payment to which you want to settle the refund. Click the Settle button for that payment. In the window that appears, click the Settle button beside the refund. Now, the payment and refund are both marked as settled. You can adjust a refund as you would any payment. For settled refunds, you cannot modify the refund amount. Hover over the Finances menu and select the Payments & refunds option. Find the refund within the list and click on it. From the refund details, click the Edit button. Adjust the refund details as required. For settled refunds, you cannot modify the refund amount. You can cancel a refund by deleting it. Any settlements associated with the refund will be automatically canceled. From the refund details, click the Delete button. You will be prompted to confirm the deletion. Click Yes to proceed with the deletion.